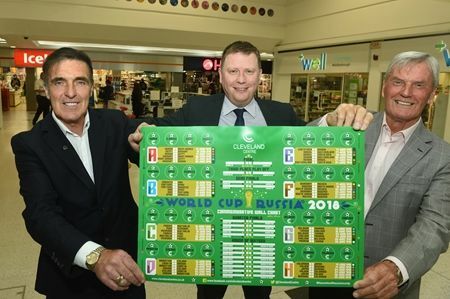 Middlesbrough football legends Bernie Slaven and Alan Peacock have helped launch Cleveland Centre’s free World Cup wallchart and sticker collection. Designed by Middlesbrough-born illustrator Sean Sims, the limited edition wallchart and stickers will be given out to shoppers in town’s largest shopping centre over the next two weeks as the World Cup gets underway in Russia. Cleveland Centre’s marketing team Emmerson Marketing commissioned talented artist Sean to design the unique wallchart and stickers to engage with shoppers. Although Sean now lives in Brighton, it is not the first time he has commissioned to take on high-profile work back home, as he has also produced artwork for Middlesbrough Council. Other work of Sean’s that has proved a big hit back home was Subway Ironopolis, a London Underground-inspired map of Middlesbrough, and Up the Boro, featuring every one of the football club’s first team shirts since their Victorian roots back in 1876. Former strikers Slaven and Peacock, who scored 287 Boro goals between them, are World Cup veterans. Slaven was part of Republic of Ireland’s squad for the 1990 World Cup in Italy, while Peacock played for England at the 1962 tournament in Chile. 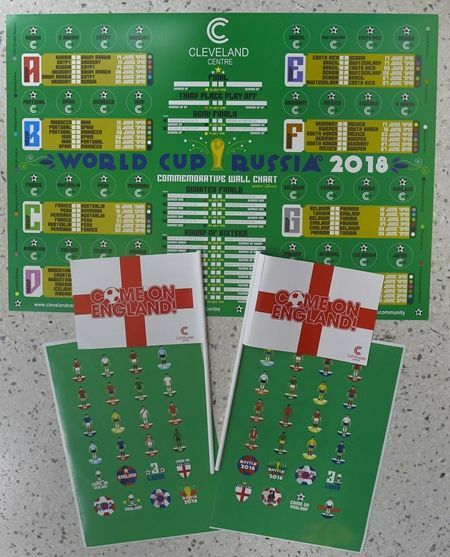 The World Cup wallchart and first set of stickers will be given out free to Cleveland Centre shoppers this Saturday (June 16) between 12 midday and 2pm, with a second set of stickers available the following Saturday (June 23) at the same time. The shopping centre’s mascot Cleveland Croc will be joined by Middlesbrough FC mascot Roary the Lion and Miss Tees Valley finalists in the World Cup giveaway zone on Newton Mall, close to Costa.